When the veggies in the autumn garden look lonely, I give them company by sowing cover crops of winter wheat and grazing rye. When planted in autumn, cold-hardy grains take up nitrogen that was not used by summer vegetables, and hold it in their tissues until it is cycled back into the soil when the plants decompose. All the while, they suppress winter weeds, prevent erosion, and improve soil structure with their vast networks of fine roots. For the gardener, there is the additional pleasure of seeing vibrant patches of green first thing in spring, or throughout winter in climates where there is enough light and warmth to keep the plants actively growing. Plantable winter wheat and grazing rye seeds are as close as the bulk bins at your local health food store. Organically grown and food-grade clean, you may find them labeled as "wheat berries" or "rye berries." In my experience, both wheat berries and rye berries (seeds) germinate willingly when planted in vacant spaces in the garden in early autumn. I should note that grazing rye and annual ryegrass are different plants. Certainly you can use annual ryegrass as a winter cover crop, but I find grazing rye easier to manage. 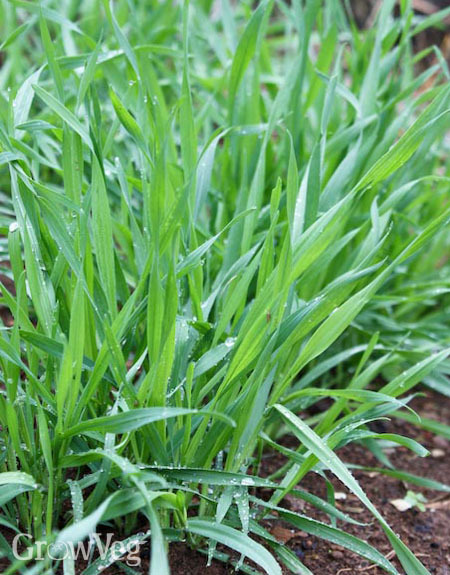 Each grazing rye plant forms a dense clump that can be dug and pulled quickly using hand tools. In addition, grazing rye and wheat produce decorative tops to gather and dry for use in flower arrangements. Both grains initiate seed production in late spring, when days become 14 hours long. I cut the tops as soon as they stiffen but before they fill up with seeds. At this point, the plants are thick bundles of grassy foliage, ideal for use as mulch or as greens for composting. A relative newcomer to the world’s grain supply, grazing rye (Secale cereale) was regarded as a weed until around 2,500 years ago, when German farmers began cultivating it as a grain crop. Tolerating cold to -30°F (- 34°C), rye also has the ability to germinate when soil temperatures are low. Most gardeners can sow rye berries well into the fall, when the best planting times for other cover crops have passed. Tough little grazing rye plants patiently wait out winter, with or without a cover of snow. They show vigorous new growth starting in late winter, and recover nicely even when nibbled to the ground by deer. As soon as I gather the decorative tops in late spring, I use a digging fork to loosen the soil, and then pull up the plants. Then I allow the plants to dry in the sun and use them later in the season as homegrown mulch. Decomposing rye foliage contains chemicals that inhibit the germination of weed seeds; studies have shown that rye foliage can reduce germination of many seeds by more than 90 percent. Rye hay makes a terrific mulch for tomatoes, peppers, and other plants typically set out as seedlings. Wheat (Triticum aestivum) comes in many forms, as you might expect with the world’s third most important grain (after rice and corn). Cold-hardy winter wheat strains often have Russian ancestry, and they are favored as edible wheat berries because of their nutty texture and high protein content. Winter wheat is quite cold hardy when established, surviving winter temperatures to -25°F (-32°C). However, it will not germinate well in cold soil, and needs an earlier start compared to cereal rye. For best results, winter wheat should be sown at least 6 weeks before your first fall frost is expected. Don’t be discouraged if your best planting date for winter wheat has passed, because both cereal rye and wheat make fun crops to grow in winter in a sunny windowsill. Indeed, wheatgrass (the greens cut from wheat seedlings), are valued for several health benefits, from enhanced mineral nutrition to the regulation of blood sugar. Unfortunately, wheatgrass doesn’t taste very good, at least to humans. Cats and dogs, on the other hand, love to graze on tender wheatgrass (or rye seedlings) grown in containers. So-called "catgrass" is often a mixture of wheat, rye, and other grasses, which are easily grown indoors in winter, either in a sunny windowsill or beneath fluorescent lights. After your pets have enjoyed munching and mangling a container of seedlings for a few weeks, you can start a new planting and transplant the tattered clump in your garden. If the weather is kind, you will have a micro-patch of winter grains helping to safeguard your soil until spring returns once again. "As always, your suggestions are just what I need at this moment. I'm pulling up bean vines as they die back, removed all the volunteer sunflowers and am actually getting some pea pods, but the rest of the garden is bare. Hadn't made up my mind which cover crop to plant, so I especially appreciate your advice right now, Barbara. Happy fall." "I'm a little confused. Do you till the plants into the soil in the spring to plant veggies? " "Jeanette, that's the way farmers do it, but in the garden it often works better to pull up the plants and compost them. Enough roots are left behind to increase organic matter, plus you return more with the compost. When you turn under anything, there is a 3 week wait to plant while the vegetation rots, and which is a long time to hold things up in a busy garden." "we have never done a winter crop and I want to try it this year. do I pull all the veggie plants up and plant the cover crop over the entire garden? or just in certain areas?" "I usually confine winter cover crops to beds or rows that won't be planted until late spring. Many hardy cover crop plants make most of their growth in early spring, so you get more benefits the longer they stay in the ground. But you would not want to cover crop areas where you plan to grow peas, potatoes, lettuce, and other cool-season crops of spring, because taking them out would delay planting." "I want to know the best way to start a cold garden. I've never done this before. I planted a small plot through our community program. I am not sure what I'm realy doing. The Garden space is mine until Feb 2011. Looking for any sugestions on helping my famliy with our food bill. Thanks to all. Christine"
"What a great article, thank you! It inspired me to investigate more about green manure, and I sowed some winter grazing rye on Sunday. However, I've just realised I didn't do it properly - I misunderstood the term "broadcast sow". I just scattered the seed on freshly dug and raked soil, but I didn't rake the seeds back in, instead just leaving them sitting on the surface. Can you tell me, as the seeds have been sitting there for three days now, if I go home and rake them in tonight, will it ruin them? Not sure how quickly the germination process starts? If someone could possibly tell me whether I should rake them in tonight or else leave well alone, I'd be ever so grateful!" "It is a confusing term, but it's not an exact science. If the soil is dry, it's customary to simply walk over the sown seeds to settle them into crevices. In moist soil or deeply dug beds you don't want to compact, a light raking to settle seeds is place is good. Germination takes about a week. I suggest raking some in and leaving others as is, so either way you win." "Thank you Barbara, I'll try that! It's not a very big patch of ground, only about 18 feet by 3 feet, so it's not the end of the world if it goes wrong I guess. " "Barbara, My husband got half a pound of wheat berries at his favorite health-food store the day I read your advice. It was raining that day, so the next day I scattered the seeds right from the bag and lightly raked over them. Then it rained for several days in a row. When planted, the 10-day forecast indicated no frost, and so far we are free of it. After reading the comments here today I checked on the seeds, and most already have germinated. The light raking left many on the surface, and I can reach them from a central path, so do you recommend covering them with a little soil at this point?" "Chriostine, I'm going to try a cold garden this year, too. I'm in central Illinois, so we do get snow and ice. I think coldframes and maybe sturdy hoophouses would be the easiest option. I can't afford to buy or build a greenhouse right now so smaller is better. I found a book through my public library on interlibrary loan called, "The Winter Harvest Handbook" by Eliot Coleman that I found extremely informative and easy to read. My husband teased me, saying I took better notes on the book than I had for my college classes! And he "might" be right, lol. I plan to try carrots and a few lettuces, we'll see how it goes. Good luck!" "Fran and Chriostine, you may find some useful information in the following articles Barbara has written on this site: Filling out your Fall Garden (http://www.growveg.com/growblogpost.aspx?id=149), particularly group C, and Growing Hardy vegetables in winter (http://www.growveg.com/growblogpost.aspx?id=124). Let us know how you get on." "Clarice, it sounds like you're in good shape. The plants will fill in as they grow, and more seeds will probably germinate as well. " "Thanks, Barbara, but I was concerned about the germinating seeds being exposed. That's why I wondered if I should toss a little soil over them before they get bigger. " "Barbara, this is the first time I am experimenting with cover crops. I planted a mixture of oats and austrian (winter) peas, which have both come up about 4-5 inches or so, but now that its getting cold (in Denver) they aren't growing much. My question is: there are still many seeds on the surface that did not germinate. I plan to till everything into the garden in the spring a few weeks before planting and I wonder if I'll would essentially be tilling in a ton of seeds that will then pop up in the garden all summer long (aka did I basically just plant a ton of weeds for next year in my garden?) Also, the oats and peas are still green (and look like a lawn essentially), will they die this winter and come back in the spring, or will new things start to grow in early spring, or what should I expect exactly? Thanks for your help!!" "Depending on your microclimate, it is likely that the oats will winterkill in your garden, which is good. They will be actively decomposing by spring. The peas will sit out winter and start growing in spring. They are easy to kill by lopping them off at the surface. Don't worry about excess seeds, because weather and predators will take care of most of them. If you do get lots of oat seedlings, they are easy to pull up and use in compost or as mulch." "This is Spring 2012 now but I just stumbled upon this wonderful information and I have some questions - we planted wheatgrass as a cover crop last fall and I'm afraid we let it go to seed - it did in fact have the seed pods visible but they seemed very immature - the garden is now tilled - the entire wheatgrass/seed pods - all went into the soil. Have we ruined the garden? Did the wheatgrass "go to seed" or was it too early for the seeds to be mature? Any advice as what to do now? " "Carol, you may indeed see wheatgrass seedlings, but they will probably be from your original sowing. Hoe them down with a sharp hoe. Immature seeds contain good levels of nitrogen, so your timing may have been perfect. You can never ruin a garden by tilling in a cover crop, only improve it. " "I live in Panama. I cannot find a location to purchase wheat/barley/rye berries etc here in bulk. I am looking for a wholesale vender to purchase in bulk with the intentions of growing large quantities. Any suggestions on where I can purchase on the internet then have it shipped here?" "I all the time used to read article in news papers but now as I am a user of web therefore from now I am using net for content, thanks to web."